Martin Brodeur is on the verge of joining one of the most exclusive clubs in all of sports. NEWARK, N.J. -- Before we get to how he’s done it, let’s first put the milestone Martin Brodeur is on the verge of reaching into perspective. What if you take 500 wins and break it down even further, taking into account the modern era of sports? “A modern era pitcher coming in in 1993 like Marty did getting 100 complete games, because nobody gets them anymore,” is how Mike Emrick, the voice of the Devils and the NHL’s national telecasts, described the milestone. Needless to say, Brodeur is on the verge of joining one of the most exclusive clubs in all of sports. The founding member of the 500-win club, and still only member thanks to the Rangers’ 4-2 win Wednesday night, is Patrick Roy, who finished his career with 551 victories. The closest active goalie besides Brodeur is Dominik Hasek, who is still 133 victories shy of 500 win status. In terms of hockey’s most exclusive fraternities, only two even compare: The 800-goal club, whose only members are Wayne Gretzky (894) and Gordie Howe (802), and the 1,000-win club, which is so fashionable that Scott Bowman is the lone member. Five-hundred goals is an incredible milestone, but Jeremy Roenick became the 40th member of that fraternity this past weekend. It’s not even in the same stratosphere of exclusivity as 500 wins. In baseball, only Cy Young has 500 wins, which he did in an era when pitchers pitched everyday. The modern day milestone is 300, and 23 members belong to that club. Heck, there are even three members of the 700-home run club now. The exclusive modern day fraternity outside of hockey that draws the closest comparison lies in the NFL, where Brett Favre and Dan Marino are the only two members of a pair of clubs: 60,000 yards passing, and 400 touchdown passes. Only four NBA players have scored 30,000 points, but Kareem-Abdul Jabbar, Karl Malone, Michael Jordan and Wilt Chamberlain are all retired. The closest active player is Shaquille O’Neal, but he’s still more than 4,400 away and may never get there. Brodeur, 35 years old and in his 14th season, has arguably been the most consistent goalie in history. He has won 30 or more games in 11 straight seasons and counting, including 40 or more the last two, and six times overall. He set an NHL record with 48 wins last season. Roy, who played 18 seasons before retiring at 38-years-old, won 30 or more 12 times in his career. He won 40 just once, in 2000-01 when he led the Colorado Avalanche to the Stanley Cup championship, beating the Devils in a seven-game series. In fairness, though, Roy played an average of 57 games per season during his career, while Brodeur entered this season playing in close to 69 per season. He has played in 70 or more games in 10 different seasons. Roy’s career high was 68 in 1993-94. Some argue that Brodeur has reached his milestone riding the coattails of one of the League’s best defensive units of all time for most of his career. Scott Stevens just gained entry into the Hall of Fame, and Scott Niedermayer is sure to eventually follow. The stats back up that great defense since Brodeur has faced roughly three less shots per game than what Roy saw, but former NHL goalie Chico Resch argues that part of the reason for the discrepancy is nobody plays the puck better than Brodeur. 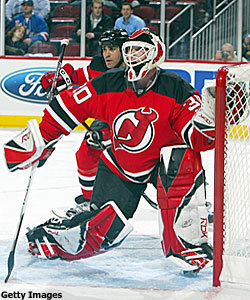 Brodeur and the Devils have twice failed to reach the milestone since win No. 499 came last Thursday against Philadelphia. Resch said Brodeur is a master at pushing rebounds into the areas he wants them to go, which in turn keeps an offense from getting second and third attempts. “Marty Brodeur has started more rushes out of his team’s end than any other goalie because he knows how to get it out,” he added. Brodeur critics – or Roy fanatics – also choose to look at the post-lockout, no-tie rules that have helped Brodeur shoot up the all-time wins list. He has 18 wins via a shootout, wins that would have gone on his record as ties before the lockout. Brodeur’s backers counter by saying overtime has gotten harder on goalies because it is now 4-on-4 as opposed to 5-on-5, and a shootout is all about the goalie. Now all that’s left is for him to finally put 500 in his back pocket. Brodeur and the Devils have twice failed to reach the milestone since win No. 499 came last Thursday against Philadelphia. Four-hundred ninety-nine times and counting.